DETROIT — These should be boom times for Detroit. Unemployment is at a half-century low, gasoline is cheap and auto sales in the U.S. were near record levels last year. Yet American automakers are closing factories, cutting shifts and laying off thousands of workers. The industry is behaving like a recession has arrived. In one segment of the market, it has. 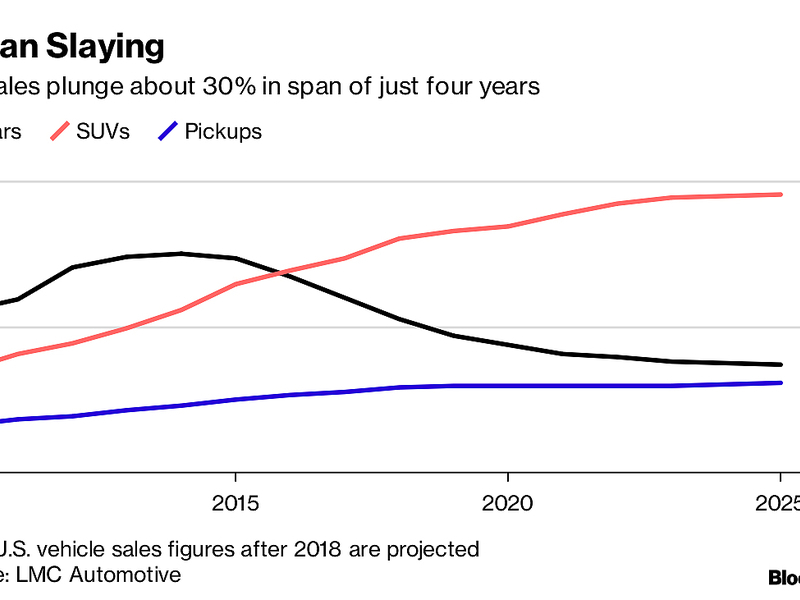 Detroit is in the grips of a car recession marked by the collapse of demand for traditional sedans, which accounted for half the market just six years ago. Buyers have made a mass exodus out of classic family cars and into crossovers and SUVs. Familiar sedan models such as the Honda Accord and the Ford Fusion made up a record low 30 percent of U.S. sales in 2018, and things will only get worse. Sales of the passenger-car body style that’s dominated the industry since the Model T will sink to 21.5 percent of the U.S. market by 2025, according to researchers at LMC Automotive, relegating sedans to fringe products. That leaves automakers with excess factory capacity that can turn out about 3 million more vehicles than buyers want. And overcapacity is precisely what spurred losses the last time a recession wracked the industry. “You could classify this as a car recession,” said Jeff Schuster, senior vice president of forecasting at LMC Automotive. It’s a situation that promises to put a damper on the Detroit auto show this week, the last to be held in the chill of January. In a bid to reestablish relevance, the annual car conclave is moving to June next year and will be reimagined as a chance for show-goers to drive new models in warm weather. The car dealers who organize the show hope the new format will entice notable dropouts — a group that now includes Mercedes, BMW and Audi — to return to an event that once commanded the full attention of the automotive world. An optimist might seek solace in the better-than-expected profit prediction issued Friday by General Motors. But a deeper look at the numbers reveals that the biggest contribution to the company’s rosy forecast were cost-cutting plans — including closing five North American plants — which it said will help boost profit this year by as much as $2.5 billion. One strategy for dealing with the collapsing car market in the past has been to stuff unwanted sedans into rental lots and other commercial fleets. That has only delayed today’s capacity crisis. Those lower-profit fleet sales have inflated the market, keeping U.S. vehicle deliveries above 17 million for the last four years, even as sales to individual retail customers peaked three years ago. Many former passenger-car buyers have flocked to crossovers and SUVs that offer more room and, these days, competitive fuel economy. The Chevy Malibu, a family sedan, gets combined city and highway fuel economy of 26 miles per gallon. The Chevy Equinox, a small crossover SUV, trails by only one mile per gallon. There are signs drivers are even ditching sedans for big trucks. “Pickup buyers are trading in crossover SUVs and sedans,” said Sandor Piszar, director of marketing at Chevrolet, which is ramping up production of its new Silverado. Total U.S. pickup sales grew 2 percent last year, to 2.4 million vehicles, in a market that was otherwise flat. Ironically, automakers have the last recession to blame for their current plight. A decade ago, when high gas prices and a crashing economy left little demand for SUVs, the auto industry suffered through layoffs, plant closings and, ultimately, the bankruptcies and bailouts of GM and Chrysler. Detroit flipped its factories from making hulking SUVs to sensible, gas-sipping sedans. “You had two quick, upward movements in gas prices in the 2000s that were like a one-two punch,” said Wakefield, “and it was like a dog whistle went off, and you couldn’t sell” SUVs. His firm helped guide GM through its 2009 bankruptcy. “It felt like gas prices would go up and stay high,” he recalled. But now the market has flipped back, thanks to consistently low gas prices, and much of Detroit is once again building too many of the wrong products. Fiat Chrysler Automobiles, which anticipated sedans’ death spiral by culling its car lineup in 2016, has largely sidestepped the restructuring pain GM and Ford are experiencing now. Instead of shuttering plants or cutting shifts, it’s converting an engine factory in Detroit to make room for a three-row Jeep Grand Cherokee and tying its fortunes to an onslaught of SUVs. The Jeep Gladiator, a truck version of the Wrangler, is due out in the second quarter of 2019. A retooled plant in the Detroit suburb of Warren, Mich., will produce the revived Jeep Wagoneer and Grand Wagoneer SUVs. The UAW has sued GM over its plant closings and is girding for a big fight at the bargaining table this year as it negotiates new contracts with U.S. automakers that have begun behaving like the good times are already in the rear-view mirror. “It’s a very bizarre environment right now because the general economic conditions are still quite favorable,” Schuster said. “But it feels like we’re going back to that” dark period a decade ago.